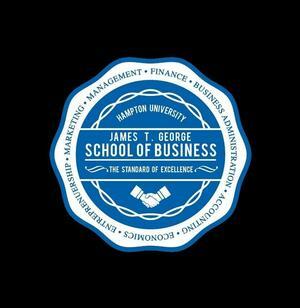 HAMPTON, Va. (April 11, 2019) – The Hampton University School of Business was officially renamed the James T. George School of Business in a special naming ceremony on Thursday, April 4, 2019. 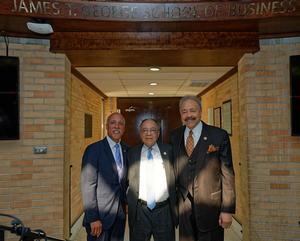 The School is named after James T. George, a Hampton University alumnus and Board of Trustee member. The ceremony included a special prayer from Reverend Dr. Debra Haggins, Hampton University’s Chaplain, followed by special remarks by Hampton University’s President, Dr. William R. Harvey. “Let me welcome you to this very auspicious occasion. We’re naming our wonderful School of Business and it is an honor,” said Dr. Harvey. He then introduced Mr. George’s family members and friends who took the time to attend this special ceremony, and spoke about Trustee George’s contributions to Hampton University over the years. Trustee James T. George earned a Bachelor of Science degree in Biology from Hampton University, where he was also commissioned as Second Lieutenant in the U.S. Army. George then went on to be one of the first African Americans to receive an MBA from the University of Arizona. 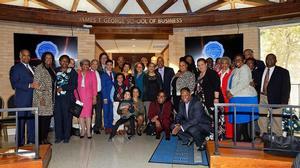 “Thank you for the honor of having my name associated with the Hampton University School of Business. Never in my boldest and most imaginative dreams would I have thought this would be part of my life’s story. God truly works in wonderful and mysterious ways,” said Trustee George. Mr. George went on to speak about the role of the business school and the vision that President Dr. Harvey has for Hampton University. “Dr. Harvey insists that the university community ‘Dream No Small Dreams,’ and Dean Hayes and her team have taken him seriously. Their vision includes the integration of business training with other schools like engineering and computer science, because companies and governments use interdisciplinary teams to develop and position products and services, and practical experience like this is to be applauded,” said Trustee George. Dean of the School of Business, Dr. Ziette Hayes, said a few words about the occasion. “We are so excited that you are here to celebrate with us. We want to thank Trustee George for his dedication and support of us. We want you to know that we continue to uphold THE Standard of Excellence in business. Our values are based on the founding principles of the institution and our vision is to provide our students an exceptional business experience that prepares them in any environment,” said Dr. Hayes. After the benediction from Reverend Dr. Haggins, the official name of the school was unveiled as the James T. George School of Business.